This my friends this is the Heart of EVERYTHING. Once you understand this, you will understand everything you need to know. First, it is important to know that the only thing that CREATES REALITY is Vibration. Vibrations CAUSE actions, responses, events to form, resonance to take place and is the SEED/SOURCE of the coming Reality. Imagine two objects side by side. One is still and the other is vibrating. The one that is still is DEAD, INERT, as far as Reality Creation goes. The one that is vibrating is CREATING! Imagine it is vibrating at the range of sound. It is making music. Imagine it is vibrating at the range of light. It is making light in different colors. Imagine it is vibrating at the range of radio waves. It is transmitting a signal to the Universe. At ANY range it is Transmitting information in some form and CAUSING RESULTS (REALITY). Here is the important take away. Vibration creates reality and is the ONLY thing that can, and it is Meaning that creates Vibration, and the ONLY thing that can. That explains all these "Placebo" examples you have heard about. The facts are DEAD, well maybe not dead, they do have a vibration, but they can be so easily overridden by a change in meaning, since they are changeable like that. So when a patient takes a sugar pill (Starting vibration Frequency of sugar), and then EXPECTS it to be something else, it Becomes the frequency that is EXPECTED. It is no surprise that people who believe the pill is medicine get a medicine results from it. Since EXPECTATION, begets manifestation, then those who believe it, are the same ones who EXPECT it as well. Simple. Remember, the famous cancer patient, who got an injection of water and was cured of stage 4 cancer in 10 days? How exactly did that work, as far as "Vibration" goes? Simple. Everything has a Vibrational signal, after all, that is what causes it to have form and certain characteristics, right? So, that means that the water was minding its own business vibrating at a certain frequency that water vibrates at, after all it is water. Had it been left alone, it would have been injected into the patient "AS WATER" (A Certain vibration), and would have CAUSED some reality as a result. The vibration of water in the body CAUSES "Hydration" which would have been slight since it was not too much water. So what happened? Good question and here comes a great answer. The Doctor told the Cancer patient that it the injection was a miracle drug. The patient, who's reality we are talking about, EXPECTED the injection was a miracle cancer cure. Well, I don’t have to tell you how powerful Meaning + Expectation is in reality creation. His Expectation of being cured, "MEANT" that the injection would now change its Vibrational Frequency to what a miracle Drug would be. YES, the water stopped vibration like water, and now was vibrating like a Cancer Cure Drug. What you vibrate, you are. Vibrate like medicine, you are medicine. Since Vibration is the Source of Reality, as it is the only thing that CREATES & CAUSES Reality, then however it vibrates is what it is in reality. So, in the same way as our first example was vibration at a certain vibration, that CREATED-CAUSED sound (Water in this example), it changed vibrations Frequency so that it now CREATED-CAUSED Light (Miracle Drug in this example). A certain Vibration = A Certain Reality. That is your Ability and Right as GOD-CREATORS to DECIDE what vibration something is going to vibrate like so that you get what you want. It is the Chicken and egg all over again. Do you decide that the injection is a miracle drug and that begets a cure, or do you first decide you are going to be well and that changes the injection to a miracle cure? Either way, you are exercising your God-Creator abilities. Most people accept things as they are, and make no attempt to alter their reality (By changing meaning-vibration-frequency of things). They just watch it happen "TO THEM" instead of being created "BY THEM." Of course they do not know how all this works or that they have that God-Given power to control their own reality, but they do. This is a tricky part and so profound at the same time. We have heard the classic brain argument about "Logic" on the one side, and "Feelings" on the other. It is always one or the other for CABAL scientist and philosophers. But, there is a "Place" where LOGIC "meets" FEELING and BOTH ARE EQUAL. The clue is that this is the Place that REALITY is CREATED/CAUSED. The answer? Meaning. What something, or some situation "Means," is the Logic function, a Calculation, estimation, deduction, and conclusion. However, the biggest understanding about all of this is that Meaning CREATES/CAUSES Emotions/feelings. When it Means something good for you, you feel good, and when it means something bad for you, you feel bad. That is the place where Logic (Meaning) and Feelings Meet AND AGREE. Meaning Causes Feelings. Control the Meaning, to change the feeling, or Control the Feeling and change the meaning. Does it matter if you say that things are working out, which feels good, or you say I feel good because things are working out? At the point of Meaning, Logic & Feelings are equal, the same. That is the point of Reality Creation. You hear people all the time say control your feelings to get a better reality, and in a way they are right. I just think that is the hard way to do it. I say, control the Meanings, that create the feelings and the reality as well. Let's see why controlling the meaning first, is way easier. Example: You are feeling bad. Your normal Law of attraction guru says "Get into the feeling of good. Feel the feeling of good." How do you get to that feeling? Of course, you figure out what you are feeling bad about, something is not working out, so then you say "It will end up working out somehow!" and you feel better. Do you realize that you changed the meaning to feel better, there is no other way. If it will work out in some way, that MEANS that things are good, and of course, that FEELS good. In short, Meaning (The ONLY thing that vibrates) is the SOURCE/CAUSE of Reality, and Feelings are part of your reality. Time To Use This Knowledge! This has been so much information just to get to "How To Raise Your Vibrations." However it was important to really understand how this works. There is only one more understanding you need to be a powerful creator and Vibration changer. That is Vibrations of a certain frequency affect all other frequencies that are near (like) that main vibration. So, without going into great detail, when you are vibrating any GOOD meaning, everything that is good, by your measure, is also getting vibration energy to manifest as well. When you are vibrating any BAD meaning, everything that is BAD, by your measure, is also getting vibration energy to manifest. One step farther, as a review, if you have good meanings, you get good emotions, and if you have good emotions, you have good meanings, Right? The same is true of bad emotions and bad meanings as well. To go a step farther, if you are having any of the good feelings/Meanings, then ALL other good things you want are also getting a manifestaional boost since they are in the same group of (High) Vibrational frequencies. By the same reasoning, when you have any of the Bad feelings/Meanings, then ALL other things you don't want to happen, that are bad by your estimation, are getting a manifestation boost as well. I am only going to talk about high (Good) vibrations (Getting what you want), and not spend a lot of time on the low vibrations (Bad - Not getting what you want). Since we Know that Meaning Creates Vibration, and Reality, and Feelings as well, then we can surmise, that Good Feelings, "Indicate" that we have a good Meaning "In-Force" (Vibrating/Creating/Causing) manifesting what we want, the good stuff. So it makes sense that we should make every effort to stay in good feelings (High Vibrations) as often as we can. The longer you stay at those levels of Feelings (Meanings), the more good things are happening for you. Yes, that includes the RV. So the "Good" things we want are different, and so each of us who are in High, Feeling Good, vibrations are creating different things, since we have different wants. However, the interesting part is, that for each of us, we have one thing in common that we want, the RV. So, while we are creating our individual good thing while in high vibrations, we are each also helping to CREATE/CAUSE Manifest the GCR/RV as well. When we get what we collectively want, because we collectively created/caused it to manifest, the World gets it as well. In short we actually help Manifest it for ourselves and the world. That is why many people with the same "Mutual Wants" who each contribute their own manifesting energy to it, can cause big things to happen and quickly! The more of us, who are in high vibration (Good Meanings, thus feeling good about things), the more powerful the creation manifestation. That is why we, the Most Powerful Light Workers, were asked to Raise up our own Powerful Vibrations (Manifesting ability) to help this happen. Who better to believe in this, to feel good about this, to EXPECT this, than us, who have the most knowledge about it, the most belief in it? We are the natural choice to Believe/Expect/Manifest it into being. So here, finally, is the answer to raising your vibrations. DECIDE is working out no matter what anyone says. EXPECT it to happen any time now. FEEL Blessed, and Lucky to be holding Trillions of dollars in your hands. Recognize that not everyone will get this, and yet, you did. Know, that not only are you getting tons of cash, but the World is being saved from the dark invading forces that have killed other planets in the past. We will be saved and free at last! Damn It, How good does that FEEL! So what if it hasn't gotten here yet, the GREAT news is that it is even coming at all! The GREAT news is that you are alive in this most amazing and wonderful time in the History of Man on this Planet. NOTHING WILL EVER BE THE SAME AGAIN. EVERY TIME YOU START TO THINK IT IS NOT WORKING OUT, CHECK YOURSELF! You are one of the luckiest people on this Planet, and as a Planet and civilization, we are lucky that we survived the Cabal. There is NOTHING that is more wonderful than that. Soon we will all be healed, at peace, and living the lives we have dreamed of. How could ANYTHING be going wrong, when ALL that is GOING RIGHT? That's right, there are no words for how wonderful, amazing and great this coming change in our World is going to be. AND, it is only a week, a day or maybe only hours away. Here is a list of the emotions (feelings) and how they rank. The ones at the top, Love and appreciation, are the Highest Vibrations (Meanings) there are, and on the bottom Fear & Depression, are the lowest Vibrations (Meanings) there are. In short stay in appreciation for all that we have now and all we have coming, and by doing that you will remain in high vibration, and be CAUSING/CREATING and Manifesting everything you ever wanted for yourself, and as a side benefit, you will help bring in the GCR as well. Worth it? Of Course! Sometimes it takes a little effort to get to appreciation of where you are in this time I history, but it is worth the effort, for your sake, and our sakes as well. 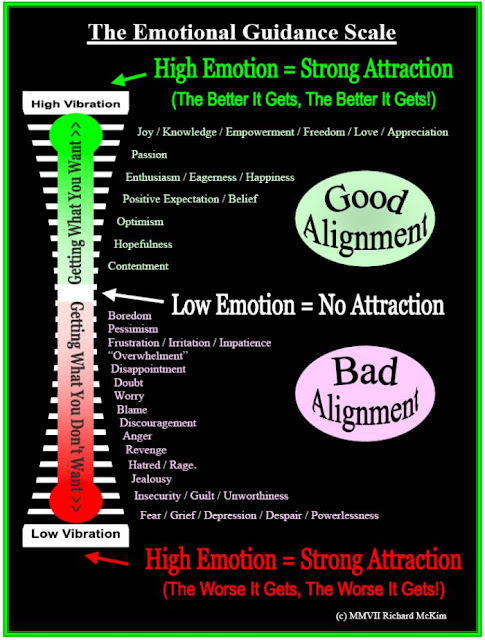 The bottom line, is that High Vibrations, are what causes everything you want to manifest. Likewise, low vibrations cause what you don’t what to happen. Stay away from those meanings and feelings, as they are very damaging. Meaning is the ONLY thing that Vibrates and is the Actual Source of Reality. It creates your Fate, "what is meant to be." But you are a God-Creator, and since Meaning is what Creates/Causes Reality, then your God Power is exercised by Creating Meanings to get the Reality you want. You can change the meaning of water, events and circumstances, at will (Your Will-Power) to create the outcome/reality you want. Easy. Since Meanings create everything including Feelings, then it is very useful to notice how you are feeling, as that indicates what you are creating. Feeling bad, bad things are being created in that moment. Feeling good, good things you want are happening in that moment. You have the Power (God-Creator Power) to decide that things are working out, and thus alter what is being manifested in that INSTANT. Will you do it? Well, that is up to you, by your Will, so shall it be, good or bad. You Decide. In short, to raise your vibration, think good and happy thoughts. How good do you have it? Pretty darn good, I'd say. How good does the World have it? Way better than they even know, after all we know what is coming and they don't, not yet anyway. Will you be pushed around by your reality, or will you decide to control it? The answer to this question could be a matter of being happy or not, life or death. It is in your hands as it always (In All Ways) has been.